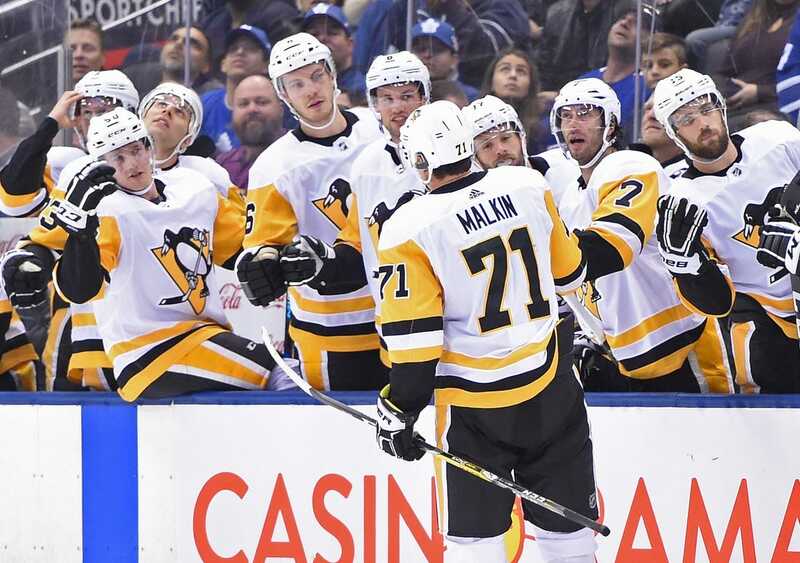 Evgeni Malkin had two goals and an assist as the visiting Pittsburgh Penguins defeated the Toronto Maple Leafs 3-0 on Thursday night. Murray kept the shutout alive when he stopped a shot from the left circle by John Tavares with about five minutes remaining in the third period. He also made saves on Auston Matthews and Patrick Marleau in the final two minutes. After Malkin scored his empty-net goal at 17:53 of the third for his third goal of the season, Kris Letang added an empty-net goal at 18:53, his fourth goal of the season. Malkin picked up a primary assist on Letang's goal. The loss ended a five-game winning streak for the Maple Leafs, who have lost twice this season in eight games, both at home. Malkin gave the Penguins the lead with a power-play goal at 11:42 of the first period, making the Maple Leafs pay quickly for having too many men on the ice. Sidney Crosby won the faceoff and the puck went to Letang. He fed Malkin, who banked a shot from the side of the net off Andersen for his second goal of the season. The power play lasted six seconds. The Penguins led 15-4 on shots on goal halfway through the first and finished the period with a 17-9 advantage. Murray was tested at 4:36 of the second period when Zach Hyman tried to ram home the puck from the edge of the crease to no avail. Andersen survived a three-on-one break by the Penguins with about five minutes left in the second period. The Penguins had a 28-22 edge in shots on goal after two periods.